Buy Online Now! - Day of the Dead Rock Concert Posters and Memorabilia. Day of the Dead is an instrumental 3 piece band formed in 2005. Taking the haunting tremolo sounds of vintage spy movies, and the twisted tones from spaghetti western soundtracks, Day of the Dead infuse modern energy into a Frankenstein of surf guitar fury. These guys sound straight out of a Tarantino film we are yet to see, and play like killers on a mission. 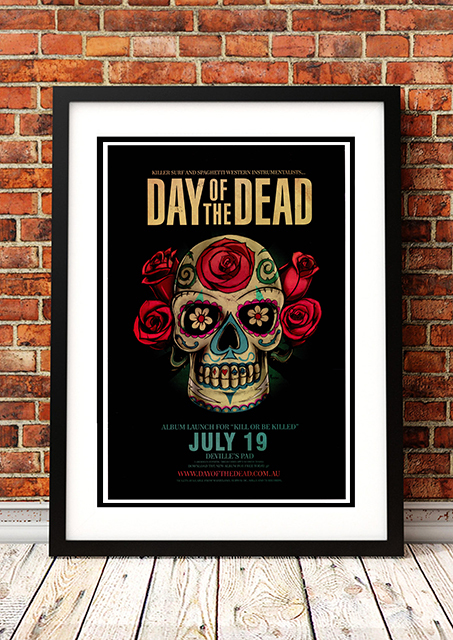 We stock an awesome Day of the Dead Concert Poster from their Australian Tour in 2008.